Microsoft SharePoint is a hosted document management system that allows for swift, secure collaboration. Allowing you to share files across your business or externally via a protected web-interface. Access files from anywhere, anytime, on any device. Microsoft SharePoint is a cloud-based service, creating an online server that can be accessed from almost anywhere. It can even be used offline using the One Drive For Business sync tool. It’s never been easier to create an intranet that will fit in your pocket, always there to keep your business connected. With Microsoft SharePoint it’s now easier and cheaper to share and collaborate on documents with colleagues, partners and customers. Our award winning IT specialists are on hand between 9am and 5pm Monday to Friday to answer any questions about the products and services we provide. Why Choose Microsoft Hosted SharePoint? Reduce costs, streamline your business and become more productive. All the advantages of on-site collaboration, whilst reducing your overall IT costs. Multi layered systems are located across geographically distributed locations. Achieved using the check-in and check-out functionality for Microsoft Word, Excel and PowerPoint files. Document types, retention polices, and automatic content sorting, content management has never been easier. All your devices, all in sync. Always have access to your team site and documents, even share access with partners and customers. We manage SharePoint for you so you can focus on what you do best, running your business! Looking for more information on our UK hosted Microsoft SharePoint solution? 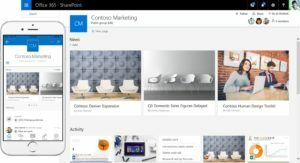 What is Microsoft Hosted SharePoint? SharePoint is a server program that allows groups to set up a centralized, password protected space for document sharing. Documents can be stored, downloaded and edited, then uploaded for continued sharing. It is used to facilitate collaboration, provide content management features, implement business processes, and provide access to essential information. SharePoint 2013 works best with Internet Explorer (version 8 or higher) or the latest version of Google Chrome, Mozilla Firefox or Apple Safari. Viewing SharePoint on a smart phone or other mobile device has been optimized. Does SharePoint provide offline access? Yes, once the sync tool is configured on the device. Can I add more storage? Yes, contact us for pricing. 10GB + 500mb per user is applied as standard and can be expanded as required. We are here to help, please leave a message and we’ll get back to you as soon as possible. Hixon Group are a leading Business IT Support Provider and Cloud Solutions Specialist based in Stoke-on-Trent. The dedicated team at Hixon Group have been helping businesses to find the technology solutions they need to succeed since 2010.